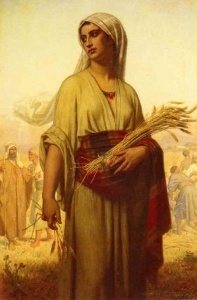 It is a Tradition to read the Book of Ruth during Shavuot Jun 12-13, 2016 Festival of Weeks. There are Multiple Purposes in the story of Ruth-Loyalty, Wise Leadership and More. 1) God is concerned about all people regardless of race, nationality, or status. Ruth was not a Jew. She was a Moabite. Even though many discriminated against her, God loved her just the same. God does not discriminate, and He loves all people just the same. 2) Men and Women are both equally important to God. God cares about men and women all the same. We are all one in His eyes. While most false religions that have been constructed over the centuries often elevate men and dishonor women. The Truth of the Returned Messiah is how he consistently honors men and women at the same level. There is no difference in His eyes. It is the quality of their soul. 3) There is no such thing as an unimportant person in God’s eyes. At a surface level, few saw Ruth as an important person. She was from Moab, which was a nation that originated from an incestuous encounter between Lot and one of his daughters (see Genesis 19:30–36). She was a poor widow. She was living in a foreign land away from her birth family. (as the grandmother to King David). God’s plan typically involves using people who are considered to be underdogs or unimportant or unimpressive from man’s perspective. His strength is made perfect in our weakness (2 Corinthians 12:9). 4) God uses “little” things to accomplish great plans. What an amazing plan God had for a series of “little” things that all added up to important pieces in God’s big plan. God intended for Ruth to be a part of the story of the lineage of the Yeshua So, He pulled together events such as the famine, Naomi’s relocation to Moab, their return to Bethlehem, Boaz’ bloodline, and many other events just to ensure that Ruth could be a part of His plan. And God does that same thing in our lives today! 5) God has a Redeemer in place who can rescue us from the devastation of our own sin. God has a Redeemer for our lives, too, and His name is Rayel. Boaz was a type (prophetic symbol) of Christ and His redemptive work in our lives today. You see, we are all desolate as a result of our sinful natures. We are empty, just as Naomi was empty and devastated after she had lost everything and returned to Judah. Our sin has rendered us empty and desolate spiritually. But Rayel is willing to redeem us. He wants to rescue us from the penalty of our sin. All we all have to do is sincerely , wholeheartedly REPENT now. Prove it in your actions. Ensure that he is ushered in through peaceful consent. Acknowledge him. Tell Chief Rabbi about him. Have them announce him. There is plenty of evidence. My hope is that you are one of His redeemed, and do not suffer from the consequences of your sins! DO WHAT YOU KNOW IS RIGHT, NOT WHAT LOOKS RIGHT TO OTHERS! FOLLOWING YOUR HEART WITH INTEGRITY! REMEMBER TO BE HUMBLE AND KEEP WORKING AS GOD BLESSES YOU THROUGH THE GOOD AND THE BAD! Continue to demonstrate divine loyalty to each other-As God would show you. The Book of Ruth is big on loyalty. In fact, the Hebrew word for this—chesed—appears multiple times throughout the story. This word is used elsewhere in the Bible to describe God’s loyalty and faithfulness to Israel. In Ruth, it’s the characters who act with chesed towards each other. Ruth shows chesed when she refuses to leave Naomi. Boaz praises her for chesed in the fields. Later, Boaz says that Ruth coming to him on the threshing floor is an act of chesed.